The key to building a great car stereo system is power with control. AudioControl's LC-4.800 4-channel amplifier generates 125 watts RMS per channel, so it'll drive even the most demanding aftermarket speakers with plenty of headroom to spare. And it'll rumble the low end too — bridge this versatile amp's output and you've got 400 watts per channel on tap to get your subs bumping. When it's time to dial in the sound, you've got plenty of control. Highly adjustable crossover networks let you set your high- and low-pass filters precisely, and AudioControl's celebrated AccuBASS® circuit ensures maximum bass performance, whether you're connected to an aftermarket or factory stereo. The optional ACR-1 wired remote lets you control the volume from your front seat. Onboard LEDs indicate optimized signal flow for inputs and outputs, plus give you a warning when a source is too loud and causing distortion. 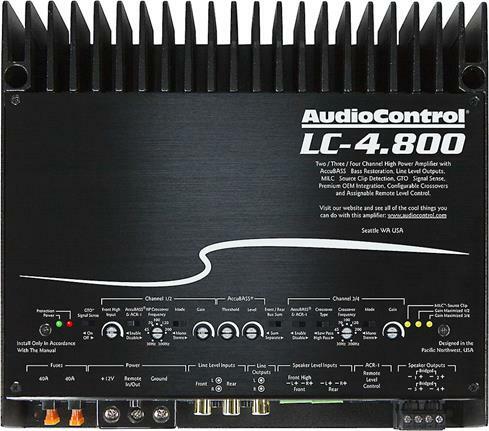 AudioControl designed the LC-4.800 to work equally well with aftermarket and factory stereos. Six active speaker-level inputs allow you to connect to almost any factory radio, while signal summing accommodates the separate bass, midrange, and treble signals in some amplified factory systems. AudioControl's GTO™ Signal Sense circuitry turns the amp on automatically whenever it senses a signal coming from the speaker-level inputs. A suite of controls lets you dial in the sound output. 4 Ohm: 125 watts x 4 chan. 2 Ohm: 200 watts x 4 chan. Bridged: 400 watts x 2 chan. 4 - 8 gauge power and ground wiring is recommended for installation.